Our goal is for patients to have excellent dental function and aesthetics for their entire lives without excessive treatment or expense. Because we know that different individuals have different dental needs, we refuse to accept the “one size fits all” approach to dentistry; we offer several treatment options wherever possible, and we will be happy to discuss the costs and benefits of each option with you to ensure personalized dental care. The American Dental Association recommends getting a dental cleaning and checkup regularly. At each appointment, our hygienists will thoroughly clean your teeth, and the dentist will evaluate the health of your teeth and gums. See our First Visit page for more information. Periodontal disease (also known as gum disease) is caused by plaque in the crevices between the teeth and gums. The consequences can be severe, including loss of tissue in the mouth and even loss of teeth, but since gum disease is painless in its early stages, it often goes undetected. The dentist checks for gum disease at each cleaning and will schedule a follow-up appointment for treatment when necessary. Where plaque has caused damage to the protective outer enamel of a tooth, a filling can restore tooth structure and protect the sensitive inner tissue or pulp. We provide several different types of fillings and will be happy to match the shade of the filling to the tooth. Crowns completely cover weak or broken teeth to protect them from further harm, and they can also be used to improve the appearance of damaged teeth. We work with a quality lab that creates beautiful, custom-fitted crowns for each patient. Bridges fill in areas where teeth are missing. When a bridge is needed, the dentist will provide a natural-looking temporary version that is customized for each patient while our lab crafts the long-lasting permanent bridge. Nitrous oxide is available upon request for most dental procedures. Children and certain other patients at risk for cavities can get sealants to temporarily reinforce teeth that are difficult to brush. In this simple procedure, a thin plastic coating is painted onto the tooth, protecting the area from plaque and food particles. We provide several different services for patients who are unhappy with the appearance of their teeth. Teeth that are chipped or slightly uneven can be reshaped for a more symmetrical smile. Discolored teeth can often be restored to their natural shade with whitening or bleaching. Discolored or damaged teeth can also be covered by custom-made veneers. We will be happy to discuss these options in more detail at your next exam or cleaning. In cases where the tissue or pulp of a tooth is damaged, we can typically perform root canals to extract decayed pulp, restore root structure, and seal off the inside of the tooth. Sometimes, for a variety of reasons, a tooth cannot be saved, in which case the dentist can perform an extraction to remove the tooth. He will discuss options for a functional and natural-looking replacement, tailored to the individual patient’s needs and circumstances. We have a long history of making high-quality full and partial dentures. As with all procedures, we understand that comfort, aesthetics, and durability are of primary importance to our patients. 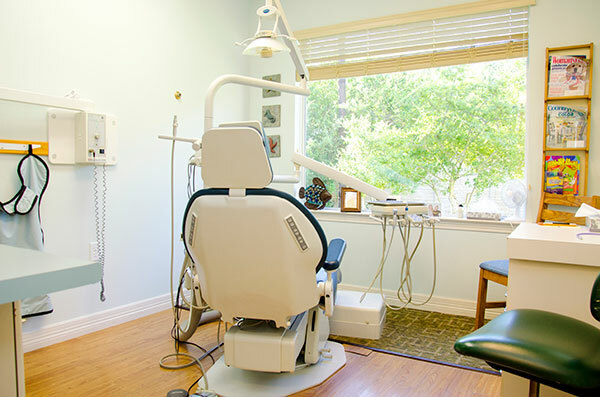 We have a long-standing relationship with an excellent Austin orthodontist, Dr. Stephen Ramsay, who visits the Lampasas Dental Center once a month to meet with his patients in the area. We will gladly refer patients to Dr. Ramsay or the orthodontist of their choice. For more information on these services or any other dental procedures, please visit http://www.mouthhealthy.org, a comprehensive website on oral health created by the American Dental Association.